CLICK HERE to see my e-books on Amazon..
CLICK HERE to see my e-books on Smashwords. 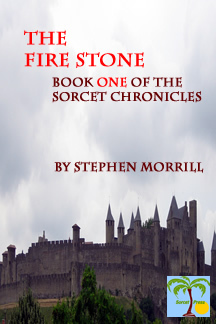 Sword and sorcery epic fantasy. On the world of Tessene, a mysterious Other has opened portals that permit dangerous creatures, people and things to pour in from worlds unknown. When Tachi and Caitlin, two college students, fall into one such portal on Earth, they find themselves in a dangerous and alien world indeed. Apprenticed to the beautiful and deadly Sorcet, a 'deru' (think druid) of the Gray Guild, they set out to help Sorcet close the portals and — perhaps — return to Earth. Try before you buy! Read samples from The Sorcet Chronicles. It's not necessary to read the books in order but there are some minor story lines that run through them. While this is the first book in the series, there is no need to read the books in order. Tachi and Caitlin fall into a portal and are transported to Tessene, landing in a 'stinger' hive where they are enslaved and worked nearly to death by human-sized insects. Rescued by an attack led by Dag, whose droichen clan shares the mountain with the stingers, they begin to learn their way around their new world, living first with the droichen mountain dwellers and then with the sylphen forest peoples. They soon meet Sorcet, a Gray Guild deru who is sworn to close all the portals and who needs taidar to help her. Taidar are bodyguards, sworn to die for, or at the command of, their deru. Tachi's and Caitlin's arrival is detected by the Other, an alien who controls the portals and who wants the two Earth people dead. The Other controls a Gray Guild magicker whom it orders to kill the newly--arrived Earthers. Tachi and Caitlin are attacked several times by killers either bribed or geased to kill them. Tachi and Caitlin get some training first and then Sorcet, Tachi and Caitlin set out to return to the Firestone Portal, this time with an army, to fight their way in through the stingers and try to close their first portal. Will they succeed in closing the Firestone Portal and returning to Earth? CLICK HERE to read a sample. Will open as a PDF. CLICK HERE to buy a book. Tachi and Sorcet are tasked with closing the Emeraldstone Portal but there is a catch: They must first get rid of an insane and vicious ruler whose palace sits atop it. Tachi here proves his worth with his ranger and thieves guild training while his adopted sister, the sylphen Leafe Willowsdottor and her pet fert assist. The Other continues to organize attacks upon Tachi, though Tachi has no idea why. In addition to a renegade Gray Guild magicker, Tachi learns of an earlier Earther who came to Tessene many years ago and who may be aligned with the Other. As this goes on, Sorcet engineers a war to draw the ruler's army away, then a revolt to attack him in his palace and, while that's happening, attempt to sneak into the underground cave housing the portal. Will they succeed in closing the Emeraldstone Portal, winning a war, and overthrowing a mad king? While this is the second book in the series, there is no need to read the books in order. While this is the third book in the series, there is no need to read the books in order. Tachi and Sorcet, joined this time by Leafe Willowsdottor, a forest sylphen, and Dag, a mountain droichen, set out for the eastern desert — inhabited by desert-dwelling sylphen who normally kill any trespasser on sight — to close the Sandstone Portal. The portal is in a remote place guarded by mercenaries and is also a 'cargo' portal capable of transporting both living creatures and non-living equipment. Sorcet is also tasked with taking in and supervising the final training of the heir apparent of a desert sylphen tribe, a young male both arrogant and troublesome. Tachi comes to realize that the Other, and its servant magicker, the Gray Guild renegade, has arranged for weapons and nuclear material to be passed into Tessene through the Sandstone Portal. The Earther from many years before is working with the Other to make a 'dirty' bomb. Will Sorcet, Tachi, Dag, and Leafe Willowsdottor, aided by two tribes of feuding desert sylphen, manages to attack and overcome the mercenaries guarding the Sandstone Portal, defeat the renegade magicker's plans, eliminate the danger of a dirty bomb, and close the Sandstone Portal? Sorcet and her faithful taidar Tachi travel to the hostile southern mountains to close the Waterstone Portal. Tachi finally meets the mysterious Earther who has been trying to kill him ever since Tachi came to the planet Tessene. Tachi and Sorcet and Tachi's friend Leafe then encounter the Other, the brutal out-worlder who is creating the portals. Finally, Sorcet and Tachi set out across the Great Sea to close the final portal and we end with Tachi's future on Tessene.. While this is the fourth book in the series, there is no need to read the books in order. COPYRIGHT: All material, and we mean EVERYTHING, on this web site is copyrighted by Stephen Morrill. Reproduction by specific written consent only. You may link to us (and we appreciate it) but if you wish to copy something to another place or print it out, ask us first. It's the law.